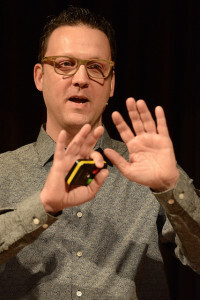 Scott Smith was introduced as Media Future Week’s favorite futurist and delivered a talk that not only showed where bots and artificial intelligence is going, but brought us back in time to where they began. He gave compelling examples of very simple bots having impact on entire governments, dark economies, and creative media. Today, when the groups weren’t continuing work on their concepts, they had the chance to attend multiple workshops put on by experts. These were meant to help students develop specialties that they could bring back to their group and be used during the week. The Media Lab was setup for students to create awesome content to compliment their presentations. It included multiple 3D printers, lazer printers, and a green screen. The participants learned about the process of the business model canvas, a model that is meant to stimulate new ideas by forcing people to focus on one area of the problem at time. This forced them to few their problem and conceptual solution from different angles. This style of presenting originated in Japan and sounds very simple: 20 slides, that are each shown for 20 seconds. No ‘clickers’ or manually switching slides, just 6 minutes and 40 seconds of fast-paced content. Delivering a presentation with auto-timed slides is not as simple as it sounds though. I spoke with one participant who has never done a PechaKucha before, but was very excited to deliver one tomorrow on her groups behalf, and wasn’t nervous at all. 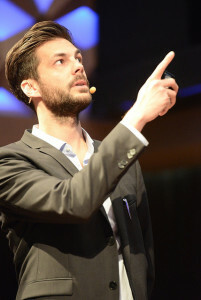 Robert Overweg is an artist with an obsession for virtual worlds, he joined us on day 3 to show some examples of how technology is changing the way people experience emotion. He shared some incredibly powerful virtual experiences that throw people into shocking new encounters they would never find in their regular life. After many hours of co-creation and workshops the participants and facilitators all met together in the sun for a barbecue. Music was blasting and good food being eaten as people tried to relax a little before the big presentation day tomorrow. The final session of reflecting, learning and growing was an interesting one. Led by Neźa, one of the facilitators, the groups held a “speed-dating” style “speed-reflection” where the teams broke off into 1on1 sessions with questions like: “What is 1 lesson you want to remember forever from one of the speakers?” The reflection turned into drinks and games before the day came to a close.